388 Marlborough is located on the south side of Marlborough, between Hereford and Massachusetts Avenue, with 386 Marlborough to the east and 390 Marlborough to the west. 388 Marlborough was designed by Cummings and Sears, architects, and built in 1885 by James Smith, mason and John J. McNutt, carpenter, for wholesale grocer Alexander Pomroy Sears and his wife Elizabeth Prescott (Jones) Sears. He is shown as the owner on the original building permit application, dated April 7, 1885, and on the final building inspection report, dated December 15, 1885. Elizabeth Sears purchased the land for 388 Marlborough on February 28, 1885, from Benjamin Williams Crowninshield and Walter Channing Cabot. It was part of a parcel with a 498 foot frontage on Marlborough, extending west to Massachusetts Avenue, that they had acquired on January 20, 1880, from John Brooks Fenno and William Storer Eaton. J. Brooks Fenno and William Eaton had purchased the land that same day from Grenville T. W. Braman, Henry D. Hyde, and Henry M. Whitney, trustees of a real estate investment trust that had purchased several parcels of land on March 1, 1872, from the Boston Water Power Company. 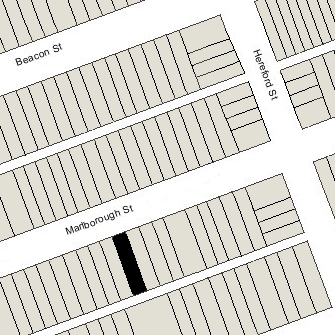 Click here for an index to the deeds for 388 Marlborough, and click here for further information on the land on the south side of Marlborough between Hereford and Massachusetts Avenue. By the 1885-1886 winter season, Alexander and Elizabeth Sears had made 388 Marlborough their home. They previously had lived at 34 Dartmouth. They continued to live at 388 Marlborough during the next season, but moved thereafter to 68 Huntington. 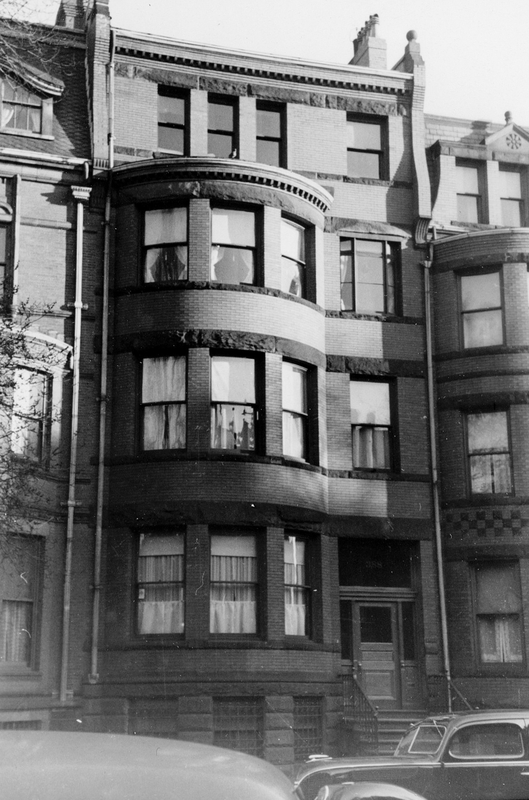 By 1889, they had made their home in Brookline. On October 28, 1887, 388 Marlborough was purchased from Elizabeth Sears by Amy L. (Field) Lewis, the wife of John Van Houghton Lewis. He was a cotton oil manufacturer from Cincinnati. They continued to live at 388 Marlborough during the 1890-1891 winter season, but had moved thereafter to Milton. During the 1891-1892 winter season, 388 Marlborough was the home of Louis Higginson, a merchant, and his wife, Anna Louise (Eastman) Lockwood Higginson. They had lived at 386 Marlborough during the previous season. May Davidson Lockwood, Anna Higginson’s daughter by her first marriage, to Hamilton Davidson Lockwood, lived with them. She married in April of 1892 to William Alexander Gaston. After their marriage, they lived at 587 Beacon. He was a lawyer in his father’s firm and later would become an organizer and president of the National Shawmut Bank. Louis and Anna Higginson moved from 388 Marlborough by the 1892-1893 season. The house was not listed in the 1893 and 1894 Blue Books. On October 27, 1894, 388 Marlborough was purchased from Amy Lewis by Mary Bangs (Bryant) Boardman, the wife of Dr. William Elbridge Boardman. They previously had lived in the Longwood district of Brookline, and before that at 233 Marlborough. William Boardman was a physician and maintained his office at 388 Marlborough. Their unmarried son, Dr. William Parsons Boardman, lived with them. He was a dermatologist and later also a professor at Tufts Medical School. William Boardman died in January of 1921. Mary Boardman continued to live at 388 Marlborough with their son. Mary Boardman died in April of 1939. In her will, she left 388 Marlborough to her son. William P. Boardman married in 1939 to Ruth Helen Hornbeck. After their marriage, they lived at 388 Marlborough and he continued to maintain his medical offices there. On January 28, 1941, he transferred the property into his and his wife’s names. They continued to live there until about 1951, when they moved to Pembroke, Massachusetts. On July 24, 1951, 388 Marlborough was acquired from the Boardmans by real estate dealer Frank DesRivieres, and on December 28, 1951, it was acquired from him by Jennie L. (Salzman) Goodman, the wife of real estate dealer Hyman Goodman. In January of 1952, Jennie Goodman applied for (and subsequently received) permission to convert the property from a single-family dwelling into nine apartments. On November 1, 1952, 388 Marlborough was acquired from Jennie Goodman by Herbert J. Weiner, a chemical engineer, and his wife, Muriel Barbara (Small) Weiner. They lived in Brookline and later in Newton. On October 19, 1959, 388 Marlborough was acquired from the Weiners by Monte J. Wallace and Neil W. Wallace, trustees of The Beacon Trust. The property changed hands and on May 3, 1978, was purchased by Paul R. McGrath, trustee of the L H M Realty Trust. On June 26, 1980, it was purchased from Paul McGrath by the 388 Marlborough St. Corp. (Paul Roiff, President; Harvey Wilk, treasurer). 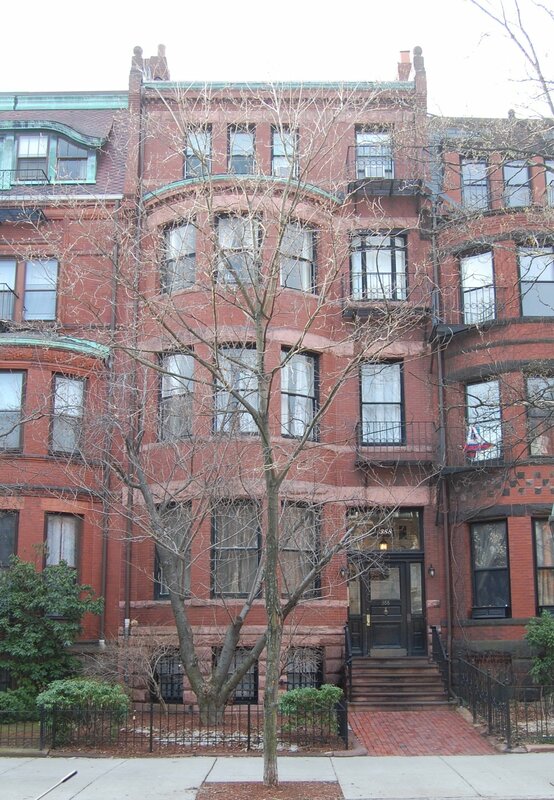 On January 14, 1981, it converted the property into nine condominium units, the 388 Marlborough Street Condominium.